This recipe takes only minutes to prepare and is a great way to jazz up your basic Caesar salad. To save time, grill or roast batches of chicken ahead of time to use in this salad, and make a larger batch of the dressing so you can whip up this healthy and delicious salad any time you want. Combine the garlic, anchovy, lemon juice, mayonnaise, and black pepper. Massage the kale with a little olive oil and salt, and put under the broiler for a few minutes, to wilt and char just slightly. Chop up the cooked chicken breast into small pieces. 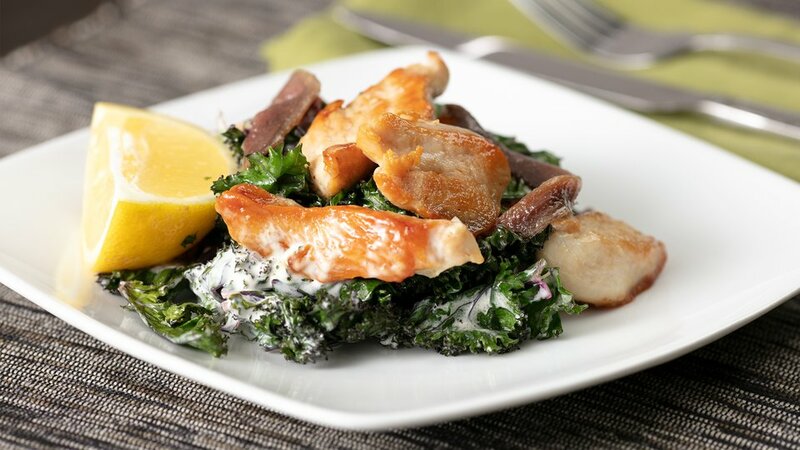 Toss with kale and dressing.